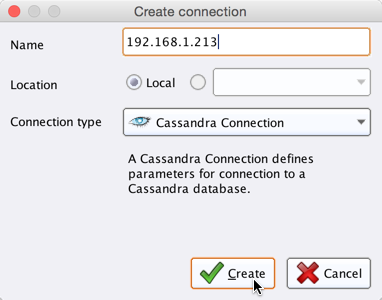 Before you can use the Cassandra connector, you have to configure a new Cassandra connection. For this purpose, you will need the connection details of your database (host name, port, and keyspace name). If your Cassandra installation requires authentication, you will also need valid credentials. The preconfigured port is the default port used by Cassandra. Note that Cassandra does not require user authentication by default. Optionally, you can test the new configuration by clicking on the Test button. 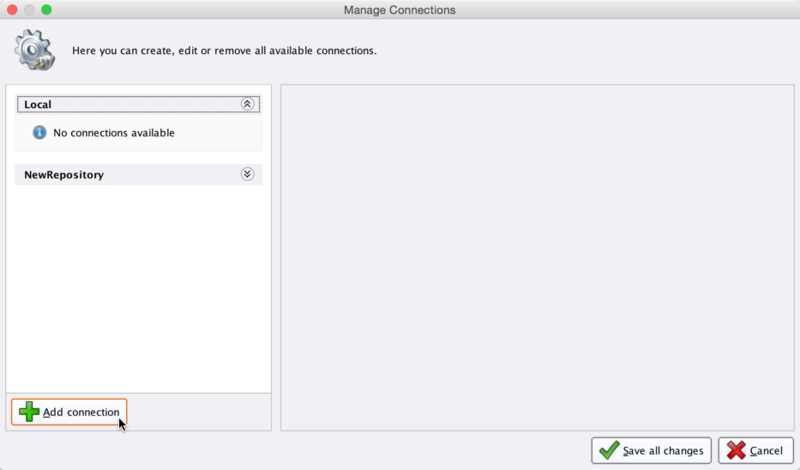 Click Save all changes to save your connection and close the Manage Connections window. You can now use the newly created connection with all of the Cassandra operators! The Read Cassandra operator allows to read data from Cassandra tables. Select your Cassandra connection from the connection drop down menu in the Parameters view. Define the query consistency level. For clusters with fewer than three nodes, it is recommended to set it to ONE. Otherwise use the default value QUORUM. Define the query type (query, query file, or table). If you choose table, another parameter will show which will be populated with the tables available. 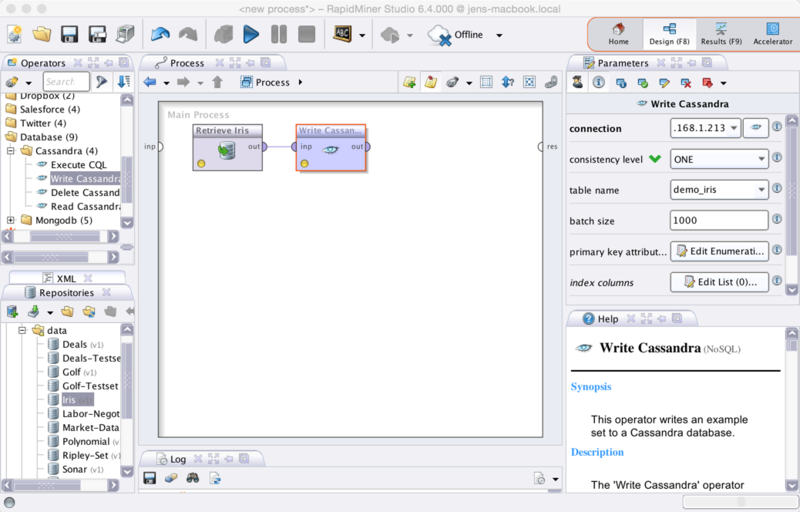 The Write Cassandra operator allows to write data to Cassandra tables. As a requirement of the Cassandra data storage system each data row needs to be identified by an unique ID (which can consist of one or more columns). 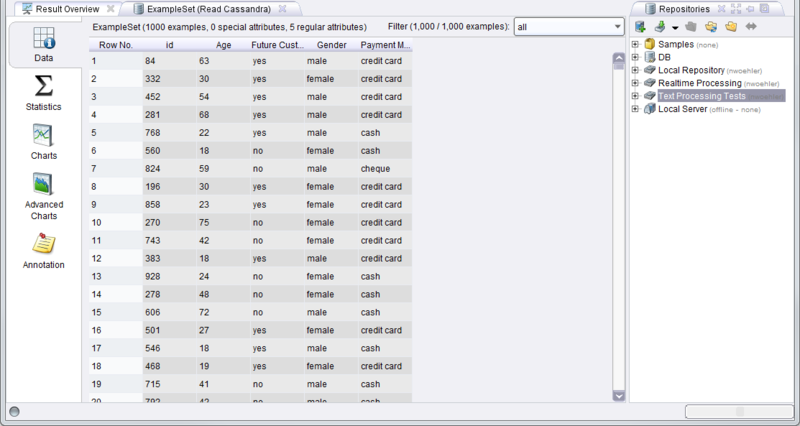 The following example illustrates how to write one of RapidMiner Studio's sample data sets to a new Cassandra table. 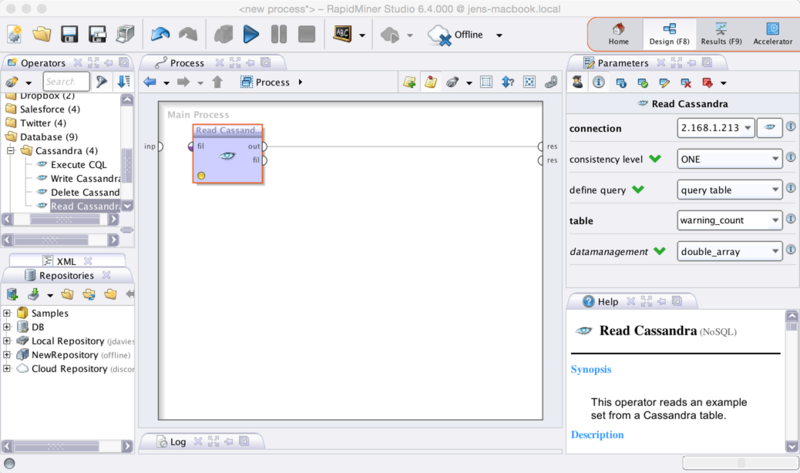 Open a new process in RapidMiner Studio. Note that you can also select an existing table. Cassandra would then update the table with the new data (if the schema of the new data matches the selected Cassandra table schema). This also means that one has to be careful when writing data to Cassandra as data with the same unique ID as the new data will just be overwritten. Connect the Write Cassandra operator to the results port and run the process!